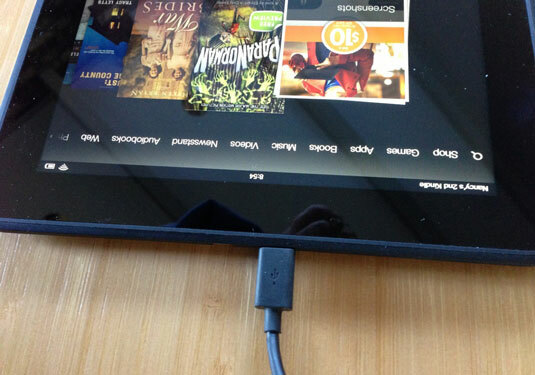 To transfer content to Kindle Fire HD, you have to use the Micro USB cable that came with your Kindle Fire HD. It’s easy to purchase or rent content from Amazon, which you can choose to download directly to your Kindle Fire HD or stream from the Amazon Cloud. However, you may want to get content from other places, such as iTunes or your Pictures folder on your computer, and play or view it on your Kindle Fire HD. The Micro USB cable has a USB connector on one end that you can plug into your PC or Mac, and a Micro USB connector on the other that fits into the Micro USB port on your Kindle Fire HD (which is located on the right side when holding Kindle Fire HD in portrait orientation). Attach the Micro USB end to your Kindle Fire HD and the USB end to your computer. 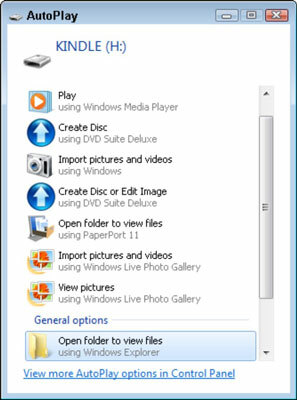 Your Kindle Fire HD should then appear as a drive in Windows Explorer or the Mac Finder. You can now click and drag files from your hard drive to the Kindle Fire HD or use the copy and paste functions to accomplish the same thing. Using this process, you can transfer apps, photos, docs, music, e-books, and videos from your computer to your Kindle Fire HD. Then, just tap the relevant library (such as Books for e-books and Music for songs) to read or play the content on your Kindle Fire HD. You can also upload content to your Amazon Cloud Drive on your computer, and that content will then be available on your Kindle Fire HD.